UTULEI, AMERICAN SAMOA (August 24, 2018) -- Today, the Bureau of Economic Analysis (BEA) is releasing estimates of gross domestic product (GDP) for American Samoa for 2017, in addition to estimates of GDP by industry and compensation by industry for 2016.1 These estimates were developed under the Statistical Improvement Program funded by the Office of Insular Affairs (OIA) of the U.S. Department of the Interior. Revised estimates of GDP for 2015 and 2016, as well as revised estimates of GDP by industry and compensation by industry for 2015, are also presented in this release. Gross Domestic Product for 2017 The estimates of GDP for American Samoa show that real GDP—GDP adjusted to remove price changes—decreased 5.3 percent in 2017 after decreasing 2.7 percent in 2016 (see Table 1.3). UTULEI, AMERICAN SAMOA (August 24, 2018) -- Today, the Bureau of Economic Analysis (BEA) is releasing estimates of gross domestic product (GDP) for American Samoa for 2017, in addition to estimates of GDP by industry and compensation by industry for 2016.1 These estimates were developed under the Statistical Improvement Program funded by the Office of Insular Affairs (OIA) of the U.S. Department of the Interior. Revised estimates of GDP for 2015 and 2016, as well as revised estimates of GDP by industry and compensation by industry for 2015, are also presented in this release. The estimates of GDP for American Samoa show that real GDP—GDP adjusted to remove price changes—decreased 5.3 percent in 2017 after decreasing 2.7 percent in 2016 (see Table 1.3). 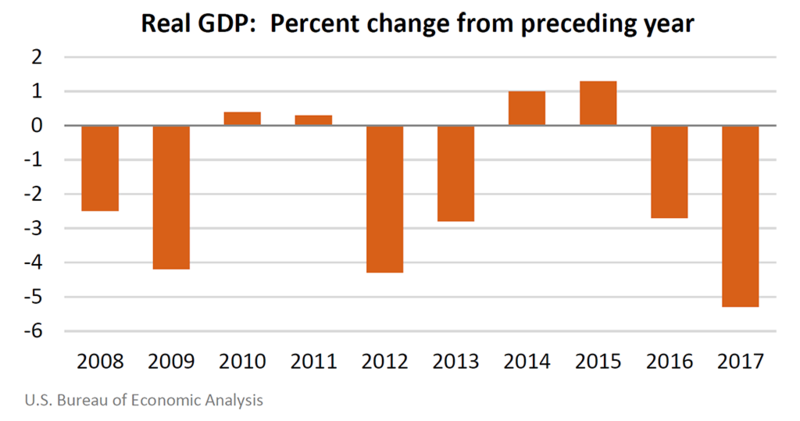 For comparison, real GDP for the United States (excluding the territories) increased 2.2 percent in 2017 after increasing 1.6 percent in 2016. The decline in the American Samoa economy reflected decreases in exports of goods and government spending (see Table 1.4). These decreases were partly offset by a decrease in imports of goods, which is a subtraction item in the calculation of GDP. Exports of goods decreased 22.8 percent primarily due to a decrease in exports of canned tuna and related products. One of two tuna canneries located in American Samoa closed in December 2016. Government spending also decreased, reflecting a continued decline in investment spending by the territorial government. Major infrastructure projects including the Satala Power Plant and the Ta'u solar microgrid were complete or nearly complete by the end of 2016. The estimates of GDP by industry for American Samoa show that the private sector and government sector contracted in 2016 (see Table 2.4). The decline in the private sector reflected a decrease in output of the cannery industry and nonmanufacturing industries, including construction. The decline in the government sector reflected a decrease in territorial government compensation and employment. The compensation by industry estimates, which are measured in current dollars, show trends in compensation for major industries (see Table 2.6). Total compensation increased in 2016, reflecting growth in wages in the private sector. The accompanying tables present estimates for GDP and its major components, GDP by industry, and compensation by industry. Also included in this release are estimates for the major components of gross domestic income. newly available wage information from the Census Bureau's County Business Patterns. The revised estimates show a similar pattern of inflation-adjusted growth as the previously published estimates (see Table 1.7). Moving forward, an agreement between OIA and BEA will extend and improve the estimates of GDP for American Samoa. The information provided by the American Samoa Government will continue to be critical to the successful production of these estimates. BEA currently plans to release GDP estimates for 2018 beginning in the summer of 2019. GDP by industry and compensation by industry estimates for 2017 will also be released at the same time. 1 These estimates are based on limited source data and are subject to revision.